Within Lotto’s oeuvre both religious compositions and portraits occupy significant positions, and the artist introduced notable innovations in the latter genre. Born in Venice, it is not known with whom he trained but his earliest works reveal a considerable knowledge of contemporary Venetian art. Lotto was a prolific artist who worked in leading centres in the Veneto and the Marche, as well as in Rome and in Bergamo, where he produced particularly notable work between 1513 and 1525. A large amount of contemporary documentation has survived on Lotto’s life and work, including letters, an account book — the Libro di spese diverse — as well as an extensive oeuvre, much of it signed. Among the early works produced in Treviso near Venice are the altarpieces for Santa Cristina al Tiverone and for the Cathedral. Executed in the first decade of the century, this is also the period of the early portrait of Bishop Bernardino de’ Rossi of 1505 (Museo di Capodimonte, Naples). This work reveals some of the characteristics of Lotto’s remarkable output as a portraitist, including the dialogue established with the viewer through the sitter’s gaze, which always looks out of the painting. In the portrait of the Bishop, with its plain background created from an intense green curtain, Lotto outlines the form of his patron, dressed in a warm toned ecclesiastical cape and firmly grasping a document. The present panel was auctioned as a portrait of a gentleman by Lotto in 1974. It entered the Thyssen-Bornemisza collection from the UK art market in 1977. Both the attribution and the idea that it might be a self-portrait of the artist were suggested in a letter by Federico Zeri written just after the painting’s acquisition for the Collection. Zeri noted that both the style and the expression of the face correspond to Lotto’s approach and that the work is imbued with a certain lyricism. He also suggested that the head was possibly a self-portrait due to the position of the model and the expression of the eyes, which seem to reflect the painter’s own gaze in a mirror. The portrait is extremely restrained and repeats a type that Lotto used for his earliest clients including the plain background, the use of a bust-length format and the precise modelling. 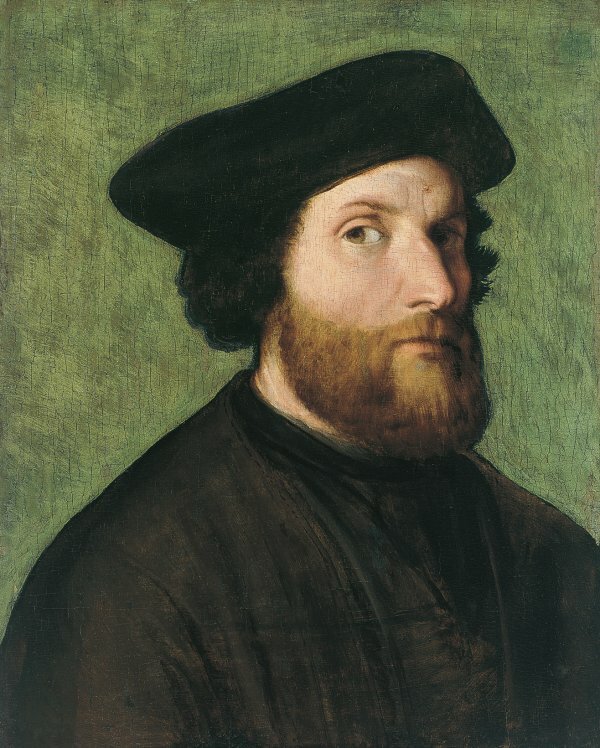 The curtain to be found in the portrait of Bishop de’Rossi is here replaced by an intense green tone that strongly emphasises the face, framed by the large, dark areas of the hair, hat and clothing. The sitter looks gravely but energetically at the viewer even though part of the face is in shadow. This format would be developed by Lotto in later portraits and the artist went on to depict half-length and three-quarter-length figures accompanied by a series of details that are sometimes difficult to interpret but which refer to the personality, interests, profession and lifestyle of his sitters.